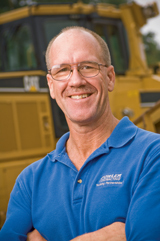 Leigh Dennis, CEM, has his work cut out for him as a member of the AEMP Emissions Task Force. He is charged with identifying state environmental authorities in the southeast and sounding a loud wake-up call to get their attention. "I'm trying to help these authorities realize their responsibilities for making diesel emissions compliance information more accessible to those who want to plan for the future," he says. According to Dennis, his past experience with governments has shown the cart almost always comes before the horse. To help curb this,Dennis and AEMP want state environmental authorities to provide information on the diesel emissions regulations they oversee. Another group that can be very involved in the issue are the state departments of transportation (DOT). They are often the driving force for non-road diesel emissions compliance because they have the most to lose—highway funding. "The U.S. Environmental Protection Agency cannot efficiently enforce mobile emissions compliance in the field, but it can cease the flow of federal funding to important state projects," says Dennis. "That's the last thing state DOTs need. Many state environmental authorities are under-funded and over-burdened with trying to regulate and enforce emissions compliance in other areas where they have true governance; however, they still have a responsibility to make off-road diesel emissions compliance information available to their constituents." That information must cover agriculture, marine, and stationary equipment, as well as construction equipment. "They just don't realize how many diesel engines there are," says Dennis. "Left to their own devices, state authorities can go crazy and just start making rules that prove too costly and even ridiculous." A case in point is Houston, Texas. "The environmental authority attempted to prohibit the use of diesel engines for much of the day from April to October," says Dennis. "They tried it, but the results were potentially so devastating, the bright idea went dark quickly and with the help of industry stakeholders, an equitable solution was found." These are the situations Dennis and the AEMP Task Force are working to avoid. "You have to be active in the whole process," says Dennis. "Otherwise, you can be regulated out of business. I want to keep that from happening." If you want a clear picture of what's in store for equipment managers in the coming years, consider the Titanic. That's how Leigh Dennis, CEM, heavy equipment service manager at Fowler Contracting in Raleigh, N.C., visualizes the future's biggest challenge—emissions management. "The Titanic collection of diesel-powered industries is steaming towards the emissions iceberg," he says. "We can see the tip approaching fast, but many don't know the full range of the legal and economic implications that hide beneath the surface. Some fleet managers are waiting for someone to tell them what they have to do. Those who are prepared will survive. Those who are not will probably go down with the ship." According to Dennis, fleet owners and managers must think, plan, and act "green" now, or a day will come when a percentage of off-road equipment will be required to have emissions-compliant power. It's likely non-compliant companies won't be allowed to bid on green projects. What complicates the picture is that the level of attention compliance receives depends on the fleet's location; whether the equipment operates in an EPA-designated non-attainment county, i.e. an area with heavy industry or heavy traffic that fails an eight-hour pollution detection test; the level of public awareness in the area; and the amount of clout given the local or regional environmental authority. Fowler's fleet, for example, operates in the sixth fastest growing state in terms of population. "In our case, the North Carolina Department of Environment and Natural Resources Division of Air Quality has not committed to providing anything more than a verbal confirmation of what the Environmental Protection Agency (EPA) requires," he says. "Right now, I'm sure they have their hands full with one of the worst droughts on record. When attention shifts toward emissions-compliance deadlines, that's when some folks in this state will begin to scramble for solutions." Similar authorities exist in every state but the power they wield varies greatly, ranging from the California Air Resources Board (CARB), which has unprecedented authority in California, to regional organizations made up of state environmental authorities, business organizations and trade industries. In many areas, state EPA members have more pressing issues, and non-road diesel emissions regulations are on a back burner—at least for the moment. Often such groups, only assist regulatory authorities with diesel emissions laws. While information about on-road diesel emissions regulations is available on environmental agency websites, off-road information is difficult to find. With 352 non-road pieces, of which 99 percent are diesel-powered, Fowler needs the information. "I have to have questions answered now because our mixed fleet has to be in compliance," says Dennis. "Down the road, we're going to have someone out there say, 'I need proof that your fleet is X-percent green.' Plus, there's a public image to maintain." Companies that require a contractor to prove the company is green likely either have money, i.e. federal subsidies, tied to compliance or they are being pressured by their insurance company. "No one wants to be hit by an environmental law suit," says Dennis. "To reduce that risk, all your subcontractors may have to be green on certain projects." Fowler is dealing with the inevitable by being proactive. They have implemented a fleet management program that is building momentum and upper management has made a strong commitment to make resources available to continue the program. "We've already cut our fleet idling time significantly with our new Earthwave FleetWatcher asset management system," says Dennis. In addition, the company's equipment management team has identified sources of biodiesel and has begun to study some of the exhaust particulate filters and catalyst equipment on the market. In the search for solutions, applying for state grants specifically earmarked for reducing mobile emissions can be a good resource. But, it's a long process. "I'm currently gathering the information required to write a grant application," says Dennis. "If it proves worthwhile, we'll submit it before the December 31, 2008, deadline for consideration next year. You have to do the research and put a plan together. It's a long process with a lot of strings attached to it that could involve such things as providing reconciliation reports or matching funds." Fowler's fleet is about 70 percent green because of fleet expansion that brought in equipment with Tier 2 and 3 engines. Future plans on greening the fleet, will depend on the government, the market and the industry. "Our state government is not pursuing the issue of non-road diesel emissions at this time, so we're still in the planning stages," he says. The only way to survive in a competitive market is if the emissions laws are applied equally to everyone, says Dennis. Another factor will be the availability of refit parts, replacement equipment and funds. "The trickle-down effect of federal highway funding, which can depend on a state's level of emissions compliance, is another consideration," he says. "However, it can be a double-edged sword. On one side, more highway money means more growth and development. On the other side, contract owners may have to require contractors to prove they are up to date on fleet emissions compliance in order to get the work."